I think the lighting during late autumn is often the most dramatic. In particular late afternoon just an hour or two before the sun hits the horizon, the light is low but bright, the trees are nearly bare yet the ground is not yet covered in snow. I think this situation creates a stark contrast between light and shadow with ground foliage still showing to add interest. 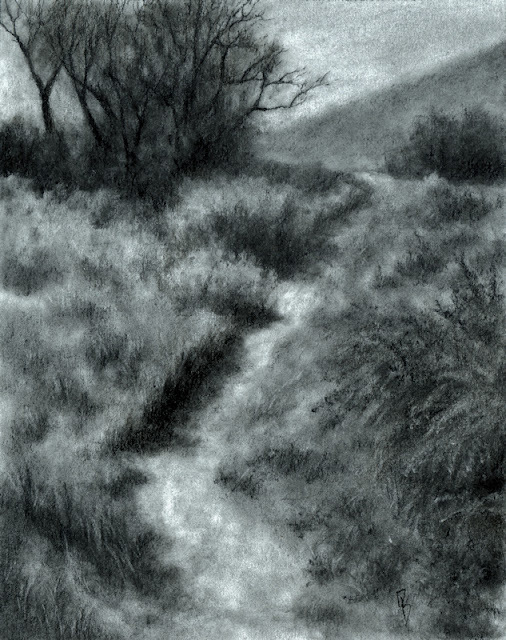 I think taking a walk amongst nature alone at these times has a very special mood that's hard to describe in words, so I tried to describe it in a charcoal drawing. The drawing is based on a photo I took in the South Jordan area of the Jordan River Parkway. This was one of the few places on the parkway where there is a significant hill to climb or descend, it's fairly steep and not real short. I think the perspective of looking uphill added to the effect. I made some small composition changes, adding the distant bush at the upper right and the distant hill for balance. I think I captured the mood pretty well, makes me want to go out for a late afternoon walk.